To begin with, there aren’t many government-owned national airlines in the world. There is none in U.S. and such entities are becoming rarer in Europe. Sooner or later, that trend will spread to Asia, inevitably to Malaysia. Maybe only in the Gulf countries such airlines can exist. It simply because many government-owned companies (in this case airline) often waste money because it is not too concerned about the profit on its expenditure. Why should they care since it’s not their money. People especially the taxpayers have plenty of reasons to be mad at the loss-making GLC’s since there is no genuine excuse for their losses. 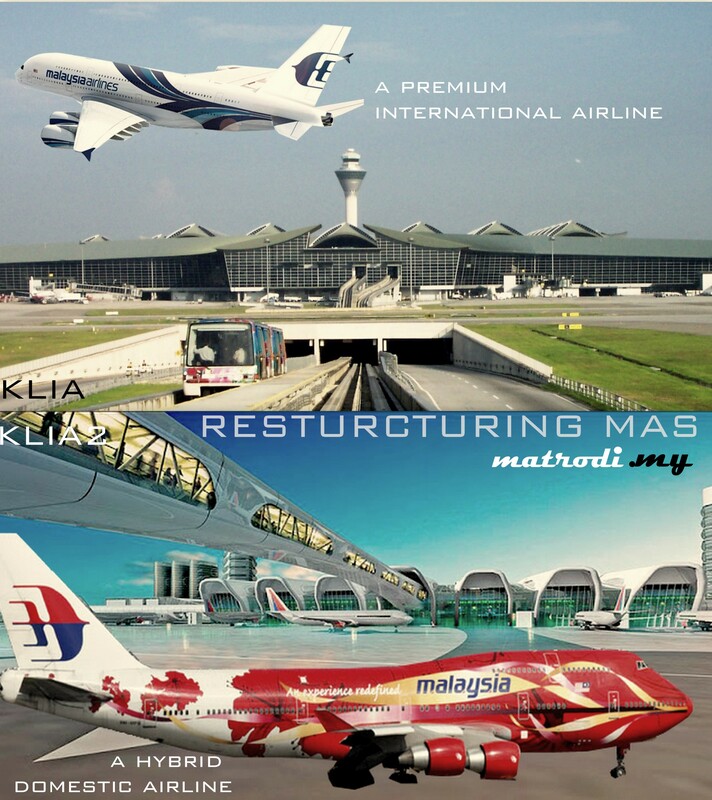 MAS is one of the blue-blooded Malaysia GLC’s that put prestige far above profit. For the last 7 years, the national carrier has made three cash call exercise for the amount of RM7 billion only to accumulate losses RM4.1 billion in three years’ time. Should the company file for bankruptcy then operate under a new company and with the same name just what Japan Airlines (JAL) and American Airlines did? Well, everyone has their own recovery model and certainly bankruptcy is one of the fastest ways to turn it around. But it is not as easy as it sounds. When the JAL filed for bankruptcy, It has shed all its jumbos, slashed its number of routes, reduced staff by a third, persuaded its unionised pilots and staff to take big pay cuts, and slashed its pension payouts by up to half. Given the current weak government at helm, obviously this is not an option as far as political backlash is concerned. In fact MAS has the glaring disadvantage of having several unions which can hold the company to ransom. Do you expect these unions to be happy if they are being told that the destruction of their jobs will be good for the company in the long term? How do you tell a man being devoured by a tiger that he is really helping to preserve a treasured species? They can even force the government to rescind the share-swap agreement. Therefore it is the only right thing for MAS to have a more gradual and sustainable recovery model by harnessing the assets and keeping the people that they have. Well how do you that? When a business is faced with stiff competition particularly a low-cost airline and its cost reduces its profits, it can either increase prices or reduce cost. However price can only be increased to a certain extent. MAS can’t price itself more than Emirates and SIA because if they do then, no one will fly with them. In fact MAS has to dump its fare so it will not be out of race. Already their market share in KLIA is slashed by half from 54% to 28%and they are not the No 1 carrier in their home country. It is far better to reduce cost and minimise the increase in price. All its cost can be examined to determine which are truly necessary, which cost can be reduced, which service can be curtailed or modified etc. etc. Some might say MAS is overstaffed. MAS with about 100 aircraft has 20,000 employees while AirAsia with 300 planes has only 9,000 staff. Obviously the number of pilots and cabin crew can’t be the same since the work rules are different. It is very clear that AirAsia, Emirates and SIA have no unions. Some of these airlines outsource their front end services and engineering works but MAS do most of them and that is why the headcount gets big. But essentially, it is about getting maximum output from 20,000 people. This is the interesting part where we can gauge MAS current management in increasing productivity. In 2013, the pilots are flying more and the planes are flying 12 hours daily from eight previously. MAS achieved its best ever load numbers (81%), even beating rival SIA. MAS flew additional 4 million passengers last year making the total passengers of 16 million. Etihad Airways flew 19 million passengers in the same year. So they have added 20% more capacity and passengers whilst using the same number of aircraft and people, and therefore the staff productivity is up by 20%. People might questioned MAS ‘load active, yield passive’ strategy but again, considering such competitive market for aviation sector last year where the profit margin is only at 1%, MAS has little choice. But can MAS do more to increase its yield? Or even profit? They can. First they can consider to expand its revenue by exploring on ancillary income. They can provide services for a fee ranging from seat selection, lounge comfort to wifi on board. Already some of national carriers in Europe derive its income from this services. Secondly- the most radical yet sensible approach is to split up MAS to two entities. Currently Firefly is not a serious competitor to AirAsia. Unless Firefly is transformed from a mere community operator into a formidable low cost carrier with large fleets and huge connectivity, then MAS can consider splitting itself into a hybrid domestic airline like Malindo Air and a premium regional/international airline. We should appreciate that Malaysia’s air transport premier market is very small because we are a developing country with a huge middle class income. This explains why the domestic market is very price sensitive. There is no way that MAS can compete against AirAsia. While it may be true AirAsia enable more people to fly but it does at the expense of MAS passengers. The ‘split-up’ move is necessary because you can’t have two cost structures under one business entity and it is unwise to have different brand proposition in one brand. To some extent splitting up MAS means to splitting up the unions. Imagine a hybrid low-cost domestic airline that flies within three-hour radius destination together with MAS hospitality and experiences to compete with AirAsia. After all, isn’t what Tony Fernandes asked for? A competition. And this hybrid airline can become a feeder airline to the premium regional/international airline. Since both airlines are flying from KLIA and soon-to-be KLIA2, the possibility is endless. Lastly, on the issue of lopsided procurement contracts- obviously referring to the catering contract, well, you should ask (sack) the MAS advisor. Neither personal nor family matter, it just business. Firefly adalah penerbangan murah MAS pada satu ketika dan merupakan ancaman kepada AirAsia kerana mendapat sambutan hebat. Atas kepandaian mereka yang berkuasa AirAsia jadi pemegang syer MAS dan penerbangan Firefly ke Sabah & Sarawak dan segala perancangan Firefly untuk berkembang telah dicantas. Walaupun syer MAS-AirAsia itu ditarik balik kerosakan telah berlaku. Akhirnya Firefly hanya tinggal pesawat Twin Engine yang mengguna kipas. Pesawat Firefly jenis Turbo Jet tak tau kemana perginya.Munkin MAS ambil balik atau diberi kepada AirAsia.Waullah hu’alam. Firefly sekarang hanya boleh terbang ke bandar2 kecil di semenanjong. Sekarang ini Firefly adalah terbang ke Singapura dan munkin satu dua laluan ke Indonesia (itu tak pasti). Seperti yang tuan nyatakan syarikat -syarikat dimana kerajaan mempunyai kepentingan iaitu bertaraf nasional selalunya jatuh bankrap. Pembesar-pembesar syarikat kerajaan tidak peduli kerana duit keluar bukan daripada poket mereka. Justeru itu satu pembersihan harus dilakukan dulu dalam MAS.Mereka yang tiada dayakerja(non-performing/excess baggage) diberhentikan. Sistem jadual kerja peramugara/ri seperti sekarang ditukar. Contohnya kurangkan kos overhead dengan mengelak penempatkan anggota-anggota MAS di Hotel-Hotel 5 bintang dinegara destinasi selama beberapa malam apabila menunggu syif seterusnya. Untuk penerbangan dalam negara bolehlah berulang alik tanpa bermalam di Hotel.Saya lihat penerbangan ke Kota Kinabalu pun anggota2 MAS akan bermalam. Kontrak membekal makanan dalam pesawat tak perlu sampai 25 tahun. Penumpang dah boleh agak menu yang akan dihidangkan dalam pesawat untuk laluan-laluan baik dalam atau keluar negara. Terdapat tidak keadilan dalam pembahagian bilangan laluan dalam negeri. Contohnya bilangan laluan penerbangan pesawat pesaing melebihi laluan pesawat MAS kedestinasi yang sama. Penerbangan pesawat pesaing mendapat keistimewaan seperti mendapat diskaun cukai lapangan terbang. Waran-waran perjalanan anggota kerajaan yang dulu mengguna MAS untuk penerbangan mereka diganti dengan pesawat pesaing. Didalam dunia perniagaan kita tidak boleh elak daripada persaingan.Namun biarlah bersaing secara sihat dan jangan berat sebelah.